The event takes place in a darkly lit room, with four carnival type set ups and an open space in the centre. On arrival you are handed a mask to put on (an exercise I found a bit pointless and irritating, partially because my mask was covered in feathers and I’m allergic.) The four set ups are each occupied by a character- a doctor, a show girl, a ventriloquist, and a clairvoyant, and each is a constantly ongoing contribution to the performance. You can visit each at your leisure, interact with them for as long as you like, and then move around the space. Every now and then one character becomes the dominating act and all the focus is on their performance and give an insight towards how it relates to the evening. The production uses a mix of lighting and the attention of the ringleader to draw your attention to the correct areas at the relevant times. The circus is orchestrated by an impish harlequin-equse spirt. She posses and torments each character in turn, and is quite eerie in posture (very reminiscent of a more evilly gleeful version of Amanda from Immercity’s Wyrd, but one who moves across the stage with a graceful step that would not look out of place in a Shakespearean play.) Each character in his or her torment aims to kill this daemon or break free from being possessed by her. The performance is carried by the dancer, doctor (who quite amusingly “freezes” when other characters are in the spotlight- twice he froze whilst holding his hands on people’s faces, with his mouth wide open inches from their faces and staring into their eyes; naturally one of these times I was one of the people) and also the malevolent taunting and tormenting spirit. The problem I had with it is that I could not, for the life of me, figure out what the hell was going on. We felt totally lost, however, on the role of the clairvoyant (who also inadvertently put his finger up my nose, which was kinda awkward.) We also couldn’t quite grasp what message we were meant to carry away with us, and genuinely felt a strong knowledge of Poe was essential for understanding what the heck we has just seen. I’ve only read the tell tale heart, so for me the way the heart’s thumping was enacted by the harlequin (who was brightly dressed in red) was great, but I failed to grasp the moral of the story, and also what role the clairvoyant was meant to play in it. I’d be interested to find out if anyone with a stronger knowledge of Poe did indeed have a more comprehensive experience. The interaction was good (actors were good at getting people involved), the free flowing space was good, and the fact that you could drink during the performance was very good. The problem for me was that I didn’t take anything profound away from the evening- other than confusion and a new-found fear of Peckham. 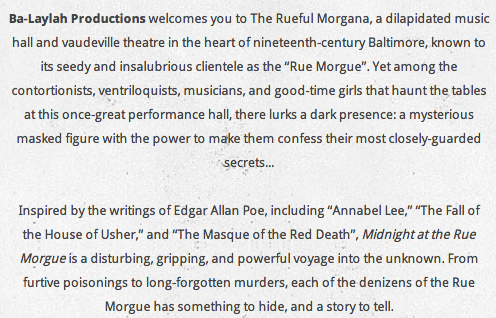 Midnight at the Rue Morgue will be at the Edinburgh Fringe Festival; find out more here. 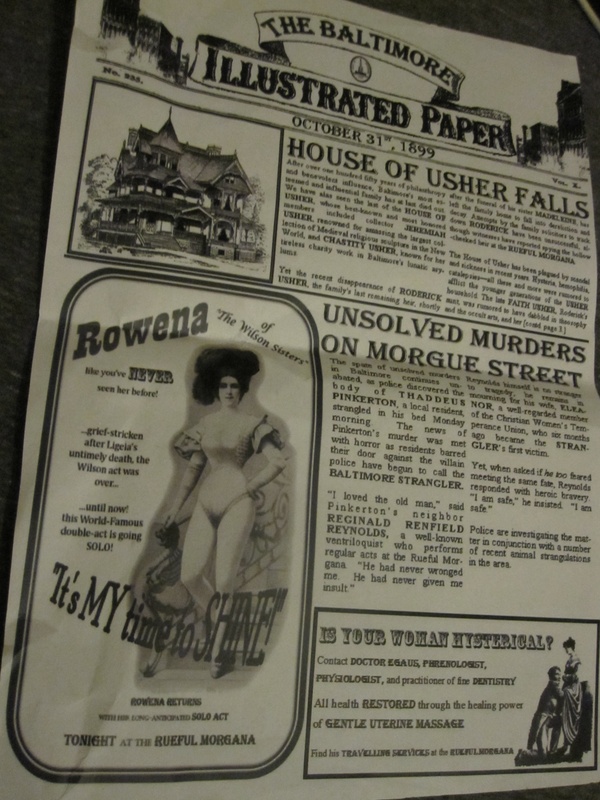 This entry was posted in Immersive Theatre, Theatre and tagged CLF Arts Cafe, Edgar Allen Poe, Review. Bookmark the permalink. Great review – Clears up a few questions I had. But still confused by the overall storyline.